What Goes On At Competitions? Marching band competitions are like track meets or swimming tournaments where many different schools compete/perform. 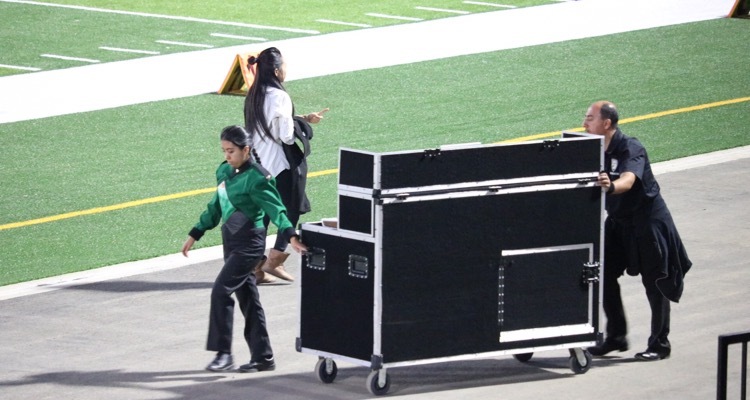 For the band, competitions are their “game days.” Band competitions are hosted by another school’s band program and take place in their football stadium. (The host band does not compete). Bands that perform are critiqued and ranked in different areas of marching band performance by qualified judges. It is important for parents to know what they should expect when they go see their students compete AND it’s very important for families to try to attend these competitions. This is OUR team’s performance and a cheering section is always appreciated ! Departure and approximate return times, plus directions on how to get to each show, are announced the week prior to each competition. 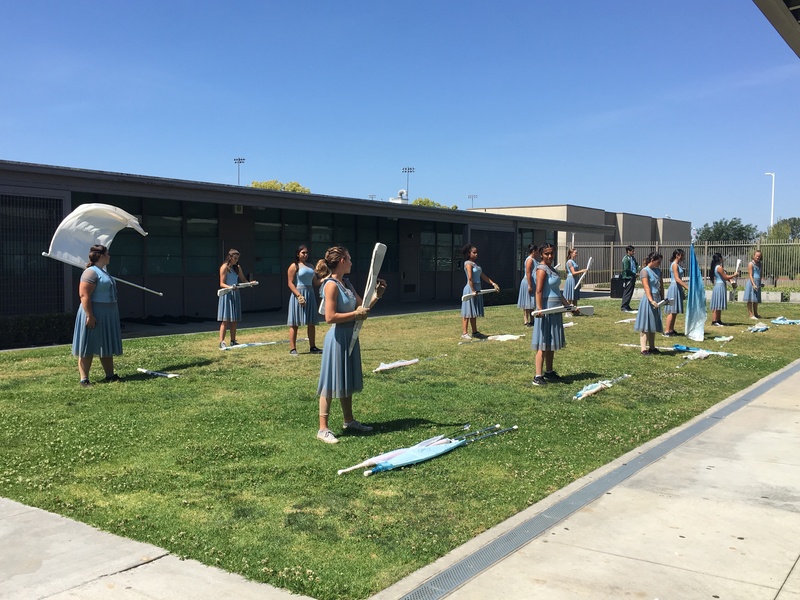 SHHS Band & Color Guard travels to each competition as a group, with chaperones and staff, on Covina School District buses. Competitions take place, rain or shine ! Dress for the weather. Cold, wind, rain and an occasional ray of sun have all been experienced. Layering of clothes is always helpful along with an umbrella/rain repellent outerwear and a seat cushion. Our performance at each show will be in the early afternoon or evening – we usually do not find out the schedule until the week of the show. Parents traveling separately from the Ensemble should plan to arrive in time to find parking and purchase tickets. Tickets for the shows are approximately $10 to $15 per person, plus programs, which can be from $3 to $5. If you have SHHS (Dark Geen/Black) colors, wear them so other SHHS parents can find you, sit together, and cheer together. Seating is first come, first seated, though it is great to be able to sit in a block. Most competitions request that you remain seated during performances, but you can clap and cheer for us ! Students report to SHHS Campus to leave for the Competition. 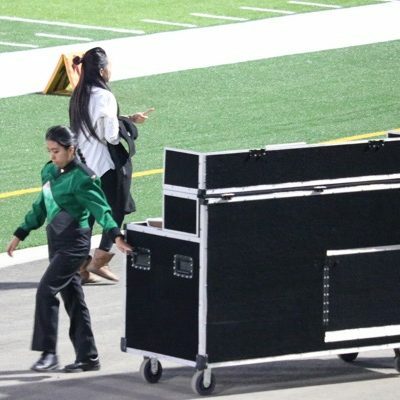 When the Band and Color Guard get to the Competition location, the trailer is unloaded and students gather their uniform pieces, instruments and Color Guard equipment. Band and Color Guard proceed to their designated warm-up areas which are usually in separate locations. 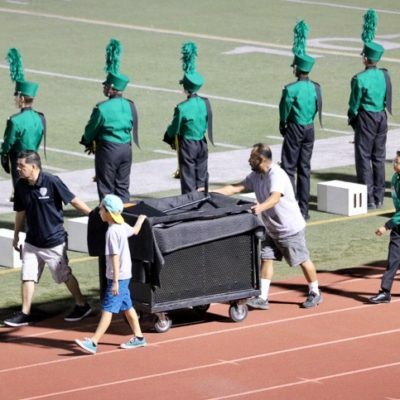 Bands may not practice or warm-up within earshot or visual vicinity of the stadium. 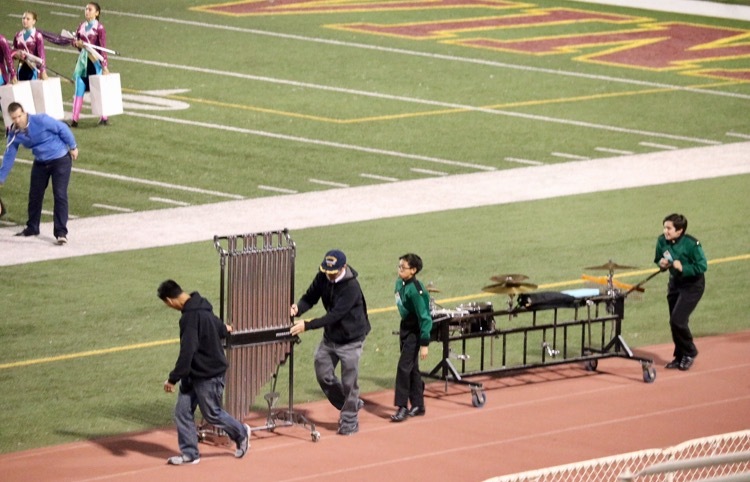 The Pit Crew will assist percussion in getting their equipment to their designated warm up area. 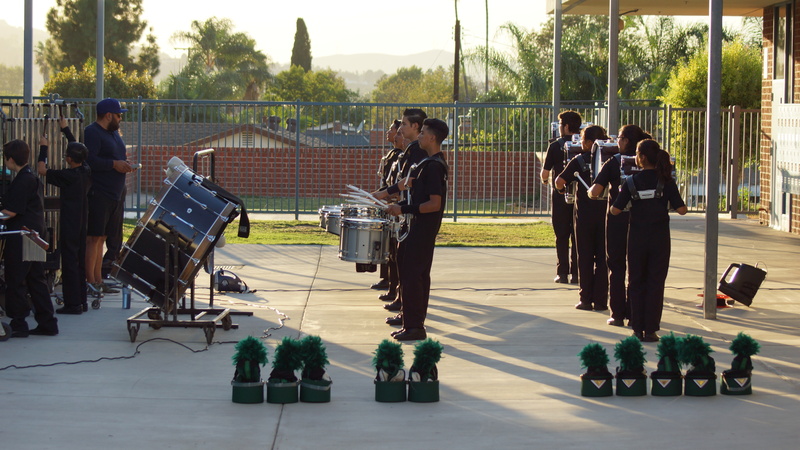 Approximately ten (10) – fifteen (15) minutes before performance, the Band and Color Guard come together and get into position. Once they are called, they enter the field. They have a limited amount of time to get onto the field. The Pit Crew drive the cart and equipment onto the field and get everything in position. The Band is given a five (5) minute maximum prep time for setup and warm up. There will be deductions for any time taken over that. The Pit Crew must leave the area before that time expires. Once the band appears to be ready, or at four (4) minutes, the announcer will introduce the band. Once the band hear their name, they are to immediately set to begin the performance. 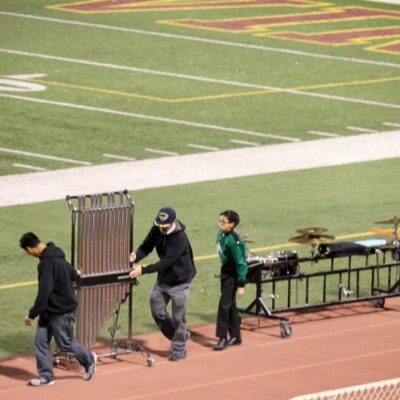 The field show must fit within certain time and musical parameters. The first note of music will start the timing of the show and must occur within thirty (30) seconds from the conclusion of the announcement introducing the band. The band is allowed a performance time of seven (7) to eleven (11) minutes. The judges watch very closely to see if the band is synchronized, in step and for the spacing that occurs. They judge the quality of the music performance as well. Another judge or two are dedicated to judging the Color Guard or other Auxiliary. 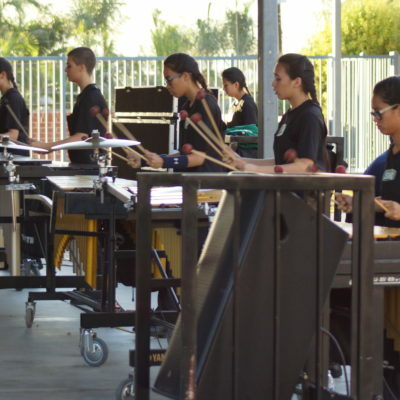 Competition classes depend on the number of performers in the Band and Color Guard. Groups of similar sizes compete against each other, within their class. 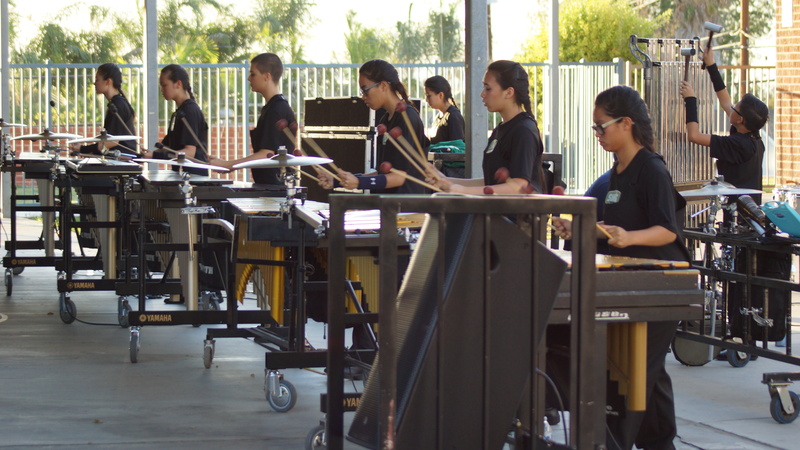 There are breaks in the competition between class performances. If a particular class has a large number of bands, the class is often divided into groups of four (4) to six (6) bands. We are a Group 4A school competing in the SCSBOA (Southern California School Band & Orchestra Association), one of the most competitive division. Competitions are fairly formal in regards to the audience similar to a professional orchestra concert. No one in the audience is allowed to be seated (nor should anyone leave) during a band performance and all audience members should remain quiet during the performance. There are breaks between categories. Following completion of your show, the band and color guard marches off the field. The band will have two (2) minutes to vacate the performance area (outside/clear of the goal line), which will be the conclusion of your fifteen (15) minute block. All props and equipment must be totally removed from the Performance Area within four (4) minutes following the end of the bands performance. All uniformed students will receive a hand stamp that will allow them access back into the stadium, the student often change into school colors or band tee shirts and get something to eat and sit in the stands to watch other bands. Most Competitions and Tournaments give out the all-important awards at one time, although some competitions will have two awards ceremonies depending on how many groups are competing. The Judges’ evaluations are given to the Band Directors prior to the awards ceremony. 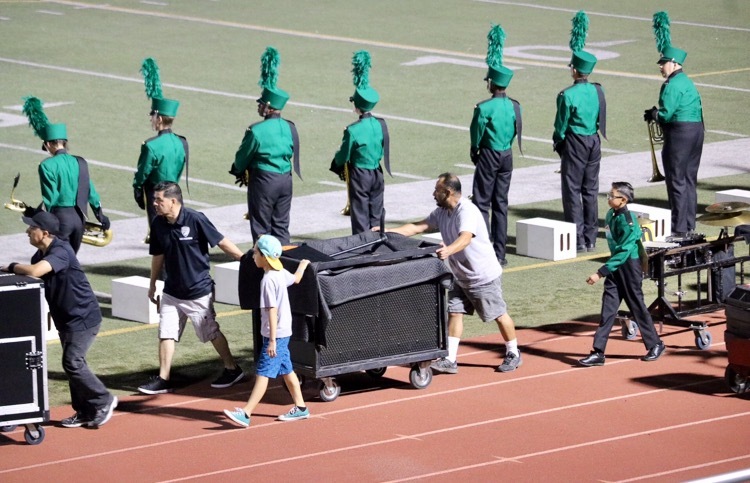 The Band Directors go over the scores and can only challenge mathematical mistakes-performances have “placed” by percentages of a point – just like the Olympics. The Award Ceremony is a treat unto itself. The Drum Majors, Percussion Captains, and the Auxiliary Captains form a semi-circle on the field. Sometimes the performers in the stands start a wave, yell or group visual of some kind. This quickly becomes a competition of its own. Some bands are extremely regimented and do none of this, and may simply stand at attention. 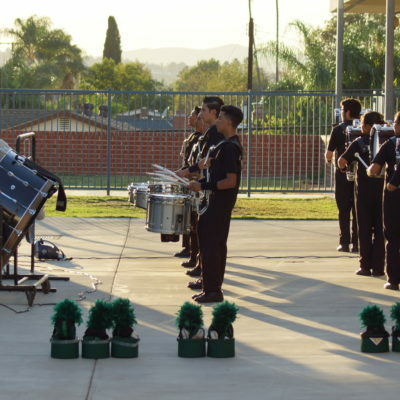 Each size class has three (3) or more categories of awards: Percussion, Auxiliary (Color Guard) and Visual/instrumental. First thru Third Place are announced – then there is Sweepstakes which is the best of all. All are awarded strictly by the judge’s calculations. When an award is given, the leadership team steps up to get the trophy and usually does some kind of distinguishing choreographed salute before accepting the award. Sometimes the routines get very complicated. The awarding group also responds with a routine of its own. There’s a lot of saluting going on. After the Award Ceremony is over (and they can take a while!) the leadership approaches the stands where the students are seated and the students cheer for their award and school. 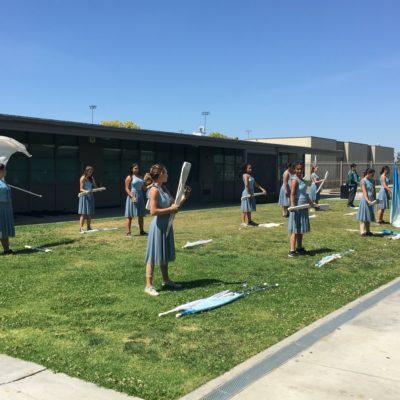 Attending the Award ceremony is extremely important – and unless there is a major time lapse between performance and the award ceremony, the Band and Color Guard always stays for the whole thing. Parents are encouraged to come and cheer the band on – this is a competition after all ! Students and staff will receive wristbands, which allow entry to the performer’s designated spectator area. All other spectators will be required to purchase their own admission and sit in the general spectator’s area. The Tournament is hosted by the Band or Band and Color Guard Boosters at that school. They can earn quite a bit of money by charging admission and selling concessions. Most schools have barbecues going and sell home baked items as well as a variety of pre-packaged food. Funnel cakes and Kettle Corn are big crowd pleasers. The choices are different at each competition. There are programs available for purchase. Usually there are photos of the bands and auxiliary as well as the program order. The times listed in the program are very accurate, but can be subject to change. Finally, students are dismissed by the band director to return to and board their buses and go home. While students choose on which bus to ride, they must ride on the same bus to and from the competition. • Make arrangements with the Band Director in advance of the competition. • Provide a written notice that the student will give to the chaperone on his/her bus. We strongly discourage separate riding because we want all of the students to be together on the trip home. Chaperones need explicit permission to release a student to his or her parents for the ride home. We take roll call each time we board buses, do not leave with your student without prior arrangements. If there are any questions and/or issues with any of the band or color guard students, THE BAND DIRECTOR IS ALWAYS THE FINAL AUTHORITY.